ImpactED is excited to announce that our team continues to grow! 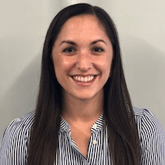 We’re happy to introduce our newest team member, Assistant Director of Evaluation, Alyssa Matteucci. Alyssa will provide crucial implementation and management support for ImpactED’s learning and evaluation efforts, and support our evaluation capacity building programs. Alyssa leverages extensive experience in research and operations, and a commitment to ImpactED’s core values of empathy, excellence, and continuous improvement. Recently, we asked Alyssa to share a bit about her background and goals. We hope you enjoy getting to know her better! Tell us a little bit about your background. Where are you from and what led you to your job at ImpactED? I am very proud to say that I am a Philadelphia native. Since completing my undergraduate degree at Drexel University, I’ve worked in academia and the nonprofit sector. I started my career as a Research Specialist and Manager of Finance and Operations at the Character Lab and Duckworth Lab at the University of Pennsylvania. There, I studied the psychology of achievement, and determinants of human potential, namely grit and self-control. My time at the Character Lab piqued my interest in business processes. Given my nascent interest in business, strong commitment to research, and passion for doing good, I accepted a position at the Wharton Social Impact Initiative (WSII) and Management Department at the Wharton School, a position I hold to this day. In this role, I manage a number of projects on organizational change and social impact. Specifically, we focus on leadership, organizational turnaround, team dynamics, gender equity, impact investing, impact metrics, recidivism and education. Throughout my career, I’ve applied my research and operations background at several other organizations. I’ve served as a consultant at the John Templeton Foundation, Bloom, and the Behavioral Scientist. Currently, I work with First Book, a social enterprise that creates equal access to quality education by making books and other educational resources affordable for kids in need. These work experiences provided exposure to content areas that are highly relevant to our work at ImpactED — education, organizational behavior, and social impact. They’ve also equipped me with the technical skills necessary for fulfilling my responsibilities here — research design, data analysis, writing. When this opportunity presented itself, it seemed like a seamless fit for my interests and skills. Additionally, I find applied research very rewarding, deeply enjoy interfacing with clients, and appreciate the opportunity to support the hard work of organizations that are investing in my home city. Can you describe your new role at ImpactED and what you’re most excited about/what you hope to achieve? I am the Assistant Director of Research and Evaluation. I work with my team to design and manage evaluation projects, and to help build clients’ evaluation capacity. As far as what excites me — for as long as I can remember, I’ve been captivated by the idea of human potential. I think far too often individuals (myself included! ), teams, organizations dwell on or feel stifled by their limitations, shortcomings, or ambiguities, and as a result, lose sight of their tremendous capability. Evaluation is a (pragmatic) practice that acknowledges challenges, and in the same breath, provides a clear path for improvement. Through precise terminology and uncompromising measurement, we clear up ambiguity, and clarify what is and isn’t “working,” what program components should stay the same, and what elements of a strategy can go. Through evaluation, our ImpactED team leaves its clients with actionable and attainable next steps. These steps, to me, are critical to reaching one’s potential, and ultimately, to providing the best services possible to one’s target population. So put simply, I’m really excited to work with and support clients who are making progress toward their potential. How do you spend your free time? In my free time, I spend time with friends and family, play the piano, or paddle on the Schuykill river with my dragon boat team. What’s the last great book you read? Bird by Bird by Anne Lamott. I’m in a perpetual state of reading this book! What historical figure (living or not) would you most like to have dinner with? Anne Frank. If I could have half the degree of optimism she has, I’d count that as a success.